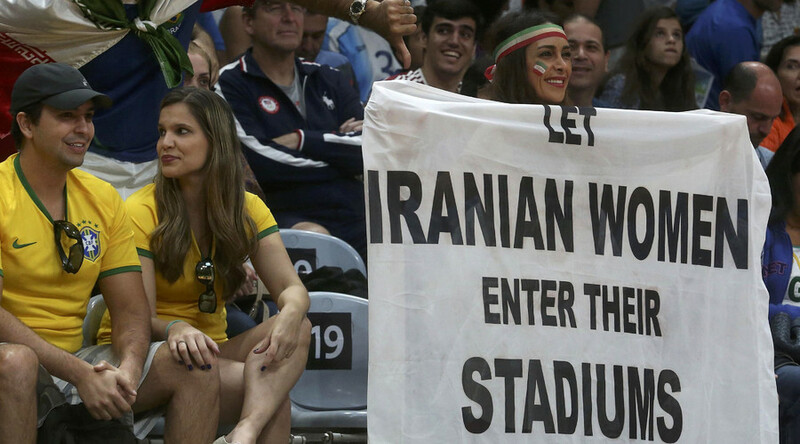 An Iranian women’s rights activist was questioned by Olympic security personnel and asked to leave the sports venue after she showed up to a volleyball match holding a large sign calling for gender equality. The 35-year-old was wearing a white T-shirt with the same message and holding up the sign when she was approached by security, AP reports. Iran’s longterm ban on women attending football matches was extended to volleyball in 2012 in an attempt by the country’s authorities to enforce further strict interpretations of Islam at social gatherings. Safai said Olympic officials tried to force her to leave the venue. She was seen briefly crying during the confrontation “because it hurts to explain again and again that this peaceful action is not a political message” but is the expression of a right, she said afterward. Security personnel abandoned their effort to force her from the stadium when she refused to leave. Despite the attempt to censor her message, Safai said she would continue her efforts to highlight the gender equality campaign. The activist, who fights against gender discrimination, founded the movement to allow women in Iran attend sporting events. She said would attempt to bring her cause to the Maracanazinho arena again during the Summer Games. After the incident, Safai was flooded with messages of support on social media.